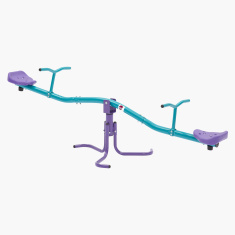 Complete your home exterior by filling that empty space in the garden with this colourful see-saw. It not only move up and down but also spins 360 degree that adds to its fun factor. The handles are easy to grip on to while the seats lend the utmost comfort and protection against rust owing to its quality make.